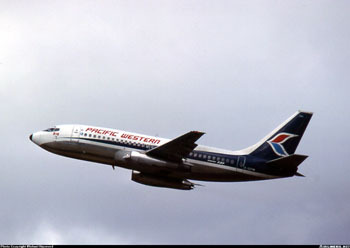 A Boeing Model 737-275, powered by two Pratt & Whitney JT8D-9A engines, and operated by Pacific Western Airlines, crashed during landing at Cranbrook, British Columbia, Canada. The accident was determined to be the result of a loss of control during an attempted go-around after touchdown. This loss of control was the result of a thrust asymmetry following an incomplete stowage of the thrust reversers. The accident killed 42 of the 49 people on board. Reverse thrust was selected on both engines upon touchdown, then immediately cancelled because of a need for a go-around in order to avoid collision with a snow removal vehicle on the runway. The aircraft lifted off and cleared the vehicle. However, the thrust reverser stow sequence was interrupted at liftoff, leaving the reversers in a partially deployed position. By design, hydraulic pressure used for the thrust reverser deploy/stow cycle was shut off as the aircraft became airborne. The thrust reverser on the right engine stowed fully and regained forward thrust, while the reverser on the left engine failed to fully stow and, following liftoff, gradually deployed fully due to aerodynamic loads. The resulting thrust asymmetry caused a loss of roll control, and the subsequent crash.